When you are in the market for a used car that is safe, comfortable, and ready to take many more adventures over its lifetime then there is nothing else quite like a used Volvo. For many years, Volvo models have been known throughout the automotive world for their ability to provide shoppers with some of the best safety and luxury around, and the selection of used Volvo models for sale here at Mitchell Volvo Cars of Simsbury will surely be able to fit all of your needs with ease. For drivers all over the Simsbury and Farmington, CT areas there is no better place for you to visit than our dealership to find your new used Volvo. We know how special these models are and we want to make sure that more drivers will be able to get what they are looking for. With our help, you will get a used car or SUV that will make it possible for you to enjoy any drive more exciting than ever before! With our ever-growing and evolving selection of used Volvo models, you will surely get the chance to get something that will offer you everything you could ever want. Anytime you visit you will be able to enjoy a selection of used Volvo models like the Volvo S80, Volvo S90, Volvo XC60, Volvo C70, and Volvo S60 and many more options! Take a few moments to learn about the great aspects of some of the used Volvo models on our lot today! With one of these great luxury crossover SUVs you will be able to get something that is equipped for the comfort of you and your passengers. In addition, many of these models will offer you advanced technology to keep your safer. The Volvo XC60 will provide you with everything you want to make driving a more enjoyable time. We are proud to bring you a selection of models that are a few years old with options from 2012, 2016, and 2017! The first SUV to come to the Volvo line-up was the Volvo XC90 and this SUV has lived a long life that has become one of the most popular options around. With its ability to expertly offer drivers of all types a cavernous interior, comfortable seating, and advanced technology. Even in a used form, the Volvo XC90 is able to impress more drivers. At Mitchell Volvo Cars of Simsbury we are able to bring you some incredible options from 2007, 2014, 2016, 2017, and 2018 to ensure you will get a spacious SUV with seating for up to seven that works better for your lifestyle. The Volvo S60 has always been one of the most popular sedans in the Volvo line-up because of its ability to easily blend the luxury drivers want with the advanced safety technology that you never knew you needed. One of the most incredible aspects about this sedan is that no matter what model year you are interested in, we have plenty, you will get something that is ready to perform on any road while making your drive more comfortable. Since the Volvo S90 was first introduced to drivers in 2016, this midsize luxury sedan has the looks to turn heads and the performance to make driving experience more exciting. One of the reasons that this sedan is able to be so popular is that it is able to bring more drivers the luxury that will make this model be unique. We are incredibly proud to offer these sedans to more drivers and make sure anyone can get something that will make your driving experience more complete. If you have been looking for the best reason to shop for your next used Volvo and want a dealership that will make your shopping experience special, then it is time to come over to Mitchell Volvo Cars of Simsbury and our staff is ready to make shopping for your next used Volvo a special experience. Visit us today and we will make sure that drivers from all over the West Hartford, CT and Hartford, CT area more enjoyable. We hope to see you soon! 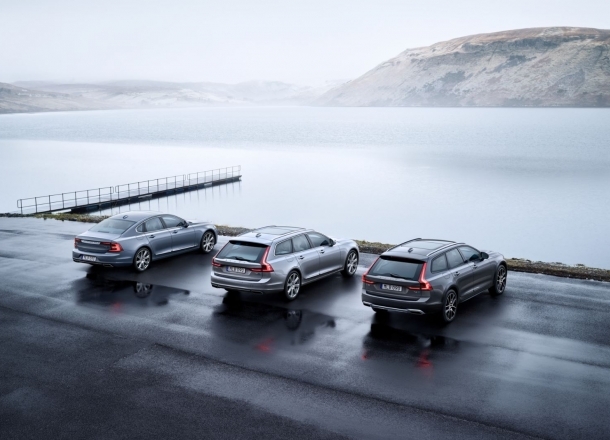 Safety and reliability come standard with the used Volvo lineup available at Mitchell Volvo Cars of Simsbury near Hartford, Connecticut. The Volvo S90 sedan offers modern design lines and the latest in entertainment and safety features to turn your morning commute up a notch. The Volvo XC40 SUV is made with extra passengers in mind, offering roomy comfort for your next road trip or trip to soccer practice. Finally there's the Volvo V60 crossover wagon, crafted to get you where you need to be with style, spaciousness and efficiency. Learn more about our lineup today at Mitchell Volvo Cars of Simsbury. Find a used Volvo model at your local Hartford, CT Volvo dealership. Here at Mitchell Volvo Cars of Simsbury near Hartford, CT our premium pre-owned Volvo cars are only bested by our friendly and knowledgeable sales team. We're a group that understands how important matching your vehicle to your lifestyle is, so we'll work with you and teach you about each model to make sure that's the case. Best of all, we'll set you up with a Volvo test drive whenever you're ready. Get the process started with a trip to our Hartford, CT area location today! Whenever you're ready, our finance team is here to walk you through the car-buying process. At Mitchell Volvo Cars of Simsbury near Hartford, CT we get it; buying used typically means looking for a great deal. That's why we'll work with your finance history, accurately assess any trade-in value, and get you a price estimate all before you buy. Find your dream car at a dream price with help from the team at Mitchell Volvo Cars of Simsbury.